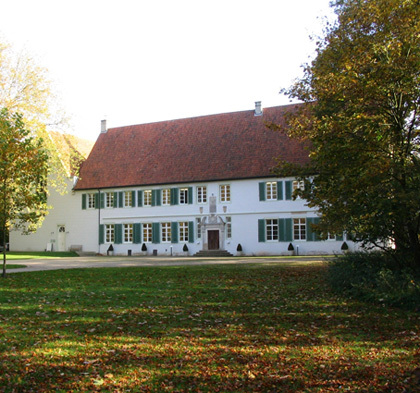 For almost 20 years, Kloster Bentlage, domicile of the Print Association Bentlage has been one of the most prominent cultural places in the Münsterland. Kloster Bentlage was built in the middle of the 15th century and today belongs to the city of Rheine. It is situated in the protected and historically important cultural landscape in northwest of North Rhine-Westphalia. Das Kloster Bentlage in Rheine ist Mitte des 15. Jahunderts von Kreuzherren gegründet worden und zählt seit fast 20 Jahren zu den kulturell herausragenden Orten des Münsterlandes, es ist eingebettet in eine geschichtsträchtige und geschützte Kulturlandschaft im Nordwesten des Bundeslandes Nordrhein-Westfalens. Im Kloster Bentlage befindet sich u.a. Die Druckvereinigung Bentlage e.V. "Ist die Druckgrafik ein sterbendes Medium oder erlebt sie eine Renaissance ?" "Is printmaking, a dying medium or an upcoming subject of renaissance ?" The Print Association Bentlage and the cultural institution Kloster Bentlage in Rheine, Germany, present SNAP, the 2nd International Printmaking Symposium, from 27 – 30 September 2012, an international symposium and exhibition program of contemporary printmaking, in cooperation with many partners. SNAP will function again as international platform to pose questions about aesthetic, philosophical and cultural as well as technical influences. New in the context of the 2nd Printmaking Symposium will be the inclusion of major publishers, galleries, museums and dealers, which illuminate the subject of printmaking from the economic side. Furthermore it will raise questions about educational strategies with regards to printmaking in contemporary times. SNAP is directed towards artists, printmakers, professors and students of international art institutes and universities, towards curators, collectorsand art critics as well as dealers and international print studio representatives, who are interested in an intellectual exchange as well as creative discourse on contemporary printmaking. Co-partner in the 2nd Symposium will be the Graphic Triennial in Krakow and the art academies in Poznan, Krakow and Katowice in Poland, in addition to our regional partners. The symposium will extend over four days this time with a program of exhibitions in various places in the Münster area and Rheine. The regional co-partners are Druckvereinigung Bentlage e.V., Academy of Fine Arts Münster, Academy of Visual Arts and Design AKI ArtEZ in Enschede, the Netherlands, Falkenhof Museum Rheine, Coesfeld district, cultural office of Bocholt, Aldegrever Gesellschaft in Münster, Polish Cultur Institut Düsseldorf, Kulturspeicher Ibbenbüren/Dörenthe e.V., town Bocholt. There will be lectures, presentations, panel discussions and workshops. Rounding out the symposium with an opening ceremony, keynote address (Keynote Speech), and an accompanying exhibition of leading retailers with product ranges in the field of printing papers, paints, printing presses, type-material and digital output techniques.